Politicians in Northern Ireland approach the most recent deadline in the protracted peace process. The leadership battles are expected to continue up to the deadline after which the fragile power-sharing arrangement faces the threat of being dismantled, and being replaced by direct rule from Whitehall. We examine the nature of deadlines, and the limitations of coercion on leaders in apparently weak negotiating positions. 15th May last year the Stormont assembly met for the first time since its suspension in 2002. 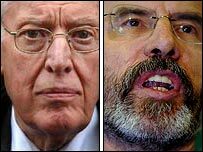 British and Irish Premiers assert that 24th November 2006 is the ultimate deadline for the politicians to agree to some format of power-sharing. Multi-party talks begin in October, (with the DUP still unwilling to meet in same room as representatives they believe to be former terrorists). Late January, Sinn Fein accepts policing arrangements (a potential sticking point for them). Elections are announced for the new assembly and these take place on 7th March 2007. Ian Paisley’s Democratic Unionist Party emerges as the largest party, and will hold 36 of the seats under the proportional representation method in place. Sinn Fein with 28 seats. Are the Ulster Unionists with 18 seats are the next largest parties at the new assembly. Last week, the elected members signed up for the new assembly, facing another ‘final’ deadline: Peter Hain, the Northern Ireland Secretary reminds them that the assembly will be dissolved, if the parties do not sign up to power-sharing before the March 26th deadline agreed jointly by the Governments of Great Britain and of Ireland. Last Friday, Dr Paisley was seeking last-minute concessions from the British Government in advance of the 26th of March deadline. However, these introduce an economic rationale to his actions. Previously his words and actions appeared to be a continuation of his ‘no surrender’ posture, and refusal to accept the legitimacy of Sinn Fein as political partners. Hostage situations begin with a demand linked with an imposed and absolute deadline. Resolution tends to require movement towards agreement, and movement away from the absolute nature of the deadline and the demands. What begins as an ultimatum, shifts towards a situation of mutual give and take. Often the ultimatum may be the response of a leader (or more broadly an individual) in a relatively weak negotiating situation. The ultimatum may include a threat of self-harm (‘Don’t come any closer or I’ll jump from this window-ledge’). This one has been agreed at one level (inter-governmental) and imposed at another level (on the political parties by the Irish and British Governments). We can also see how deadlines may be presented as immutable when they are actually rather arbitrary. Immutable deadlines would include those when the missing one triggers off other very serious consequences, which can be legal, economic, technological, or medical. Other deadlines seem more arbitrary, for example, when accompanying efforts to achieve movement in political negotiating processes. This one seems to be an imposed and somewhat arbitrary deadline disguised as an agreed and ultimate one. Dr Paisley on behalf of the DUP places himself in the relatively weak position of opposition to the trajectory of power-sharing. However, he is at the same time a strong position for arriving at some concessions and some wriggle room. There has already been a possibility of a billion pound offer in what appears to be a negotiating chip from Westminster this week. Such negotiating gains may just about permit Dr Paisley to do what he has repeatedly insisted he would never do, and sit down with those with connections with terrorist acts of violence. And to do it without losing political credibility to others who would follow his earlier ‘no surrender’ rhetoric. It looks as if the ‘final deadline’ will turn out to be a more arbitrary one. Dr Paisley may hold his first-ever meeting with Gerry Adams, later today. The latest events more tortuous process towards peace in Northern Ireland since the time of the Good Friday agreement. It may have reinforced the belief that politicians often say one thing and mean another. Sadly, it will also reinforce the more dispairing beliefs of those who believe that politicians are always duplicitous, and never to be trusted. Which was one of the messages in the recent TV series about the traps to personal freedom. You are currently browsing the archives for the Good Friday Agreement category.